Still on a Thanksgiving turkey high, we agreed to the task of rebranding the company and launching its real-time queue management technology at the show – all within seven weeks. Working closely with Brickstream’s marketing team, we immediately started executing on a dual-track program. One group, working with Brickstream’s Vice President of Marketing, Christina Ellwood, began a positioning, messaging and branding exercise to develop the company’s new brand voice and visual articulation. The second group, led by Brickstream’s Director of Marketing, Yamini Kagal, was charged with developing an NRF attack plan that would garner wide-spread attention at the show – despite the company not having its own booth at the show, and having limited sponsorship funds to work with. Click here to see the visual elements from the Brickstream re-launch at NRF. On the messaging front, following a series of executive workshops and competitive research, the concept of “smart” was selected. The message aggressively laid claim to Brickstream being a leader in behavior intelligence solutions for environments where people shop, gather, work and play. This positioning gives Brickstream the ability to promote its SeeMore 3D smart data capture technology and advanced behavior analytics solutions for brick-and-mortar locations such as retail stores, supermarkets and banks. At the same time, it highlights the technology’s key differentiators of easy configuration, proven accuracy and completeness. With no time to spare, Arketi’s branding team built on the new messaging and in double-quick time created a new brand for Brickstream, starting with a new corporate logo and a rich portfolio of brand assets. Once these were approved by Brickstream senior management, the team used the assets to develop a suite of marketing collateral, and to engineer a complete facelift for the Brickstream website. At the sixth annual Technology CMO Roundtable, 62 percent of attendees said they plan to maintain or increase their tradeshow activity in 2013. Get more out of your tradeshow investment by scheduling in-person meetings with journalists and your executives. Seven strategies ensure tradeshows deliver PR benefits. In the meantime, plans for the company’s presence at the NRF show were progressing at a similarly breakneck pace. A joint Arketi-Brickstream team brainstormed dozens of ideas to “make a splash” at the BIG Show – three different overarching themes, two tradeshow uniform options and a dozen guerilla marketing tactics. Early in the process, it was decided that central to Brickstream’s visibility at the show would be a yet-to-be-created mascot for the company – Seymour. The team worked feverishly to secure a tradeshow presence in seven partner booths (including a 20-by-15 area in one booth), sponsorship of the opening reception, advertising floor tile placement in the main show entrance area, interactive show entrance monitor recognition and mobile app sponsorship. The character Seymour – a play on the concept that Brickstream’s technology lets its customers “see more” of what’s going on in their environment – was brought to life, first as a cartoon, and then as a walking, talking, real-life character. A costume was created, and on-floor engagement activities were designed for Seymour to interact with show attendees. This guerilla marketing approach was complemented by a new blog, hate2wait.com which invited online interaction with Seymour and showcased the launch of Brickstream’s QueueIQ queue management solution. To further ensure that Brickstream would not get lost in the sea of 27,600 exhibitors and attendees at NRF, Arketi proposed an eye-catching tradeshow uniform for Brickstream booth personnel – bright orange checkered pants, white shoes and an oxford shirt with Seymour peeking around the side of the outfits. After some hesitation, the sales team eventually embraced the uniform, following Brickstream CEO Steve Jeffery’s lead in donning the “outstanding” ensemble. Like a video of an explosion played backwards, all the many components of Brickstream’s re-launch came together at the last moment, right on cue. Just 12 days after the New Year, a Brickstream team of 20 greeted their first guests at NRF’s Annual Convention & EXPO at the Javits Convention Center in New York City. The Technology Association of Georgia teamed with Arketi to launch a cool app-like website showcasing its annual State of the Industry Report. Check out this video that introduces the site and its interactive interface. 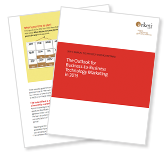 Arketi’s latest white paper, The Outlook for Business-to-Business Technology Marketing in 2013 highlights five major trends, six tactical takeaways and the results of participant surveys from the sixth annual Technology CMO Roundtable. Click to download a free copy. When the dust settled, the joint Brickstream-Arketi team’s big thinking and rapid execution paid off. Brickstream’s desire for a “larger than life” presence was more than realized – the company engaged with more than 200 prospects at the show and is currently working nearly 30 sales qualified leads as a result. In addition, Brickstream partners were thrilled with the excitement created in their booths by the sales team (and their pants! ), Seymour and the guerilla marketing activities, which included on-the-spot lottery ticket payouts and the “how long have you waited in your lifetime?” calculator. Brickstream has since replicated many of the NRF ideas at shows in India and Singapore. Thanks for reading Core. If you liked “Together, We Did It: How Arketi Client Brickstream Broke Through at NRF,” please share it on Twitter. And please send your comments, compliments and criticisms to us at core@arketi.com. Sign up for Core, the Arketi newsletter.